I followed that link. Really hope there is no BL romance there, I can not get over his BL romance in guardian so not want any more. He should have a character who will have great chemistry and a happy ending with a girl, or a pure action character is great too. Almost all the video information of Zhu Yilong can be found in this link, up to many years ago, and updated every day, but there are no English subtitles. This is the opening video of Zhu Yilong's endorsement of Lenovo's new mobile phone. This is Zhu Yilong's customized mobile phone, tangerine pink, with his stamp signature on the back. This mobile phone has a global limit of 4,160 copies and is now sold out. 0416 is Zhu Yilong's birthday. A total of 9, I didn't upload all of them. Have you seen this seven-second video? This is Zhu Yilong's advertisement for L 'Oré al, more touching than the advertisement itself. He is Narcissus at the water's edge. 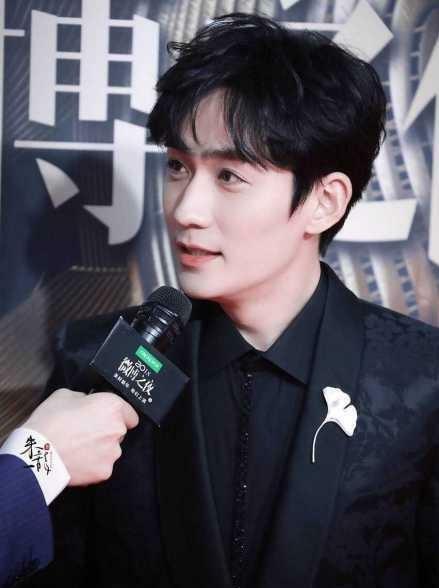 Poor Zhu Yilong was placed in the middle of China's two top beautiful actresses on Weibo night. He was stiff during the whole meeting, but the audience were luky because the three of them were the top beauty in the whole meeting. As a matter of fact, there is no CP (couple) in the restart of grave robbing notes (or Restarting of Tomb Raiding Notes )(leading roles ). However, due to the status of grave robbing notes series in China is similar to that of Harry Potter series in Britain, there are many derivatives，there are all kinds of CP in grave robbing notes series, which makes the original author unable to ignore them. Of course, we can ignore these CP. The unified opinion of the fans of Zhu Yilong(Xiaolongbao) is to ignore all CP. Zhu Yilong shuold be beautiful alone. Ha, ha, ha. He has just posted two selfies on weibo! It’s been too long since he last posted a selfie (that was before the shooting of Restart). And now half of the shooting schedule has past. And I really like his parka and scarf, which are the same as what he wore last year when he was filming The Story of Minglan. That black parka has BFA logo on it. Unfortunately you are not allowed to buy it if you’re not a BFA student. Oh, and the emoji he used stands for Qi Heng, because that emoji is called “Heng Heng”(an angry sound). I just find everything about him is so cute. He has also recorded a song yesterday, which will be put online in a few days. And he will go to record a CCTV show called “Straight to Spring Festival Gala” on 16th. He will be still working during the spring festival. And after Tomb Notes Restart, he wishes to do some movies. He has just posted two selfies on weibo! It’s been too lo﻿ng since he last posted a selfie (that was before the shooting of Restart). And now half of the shooting schedule has past. And I really like his parka﻿ and scarf﻿, which are the same as what he wore last year when he was filming The Story of Minglan. That black parka has BFA logo on it. Unfortunately you are not allowed to buy it if you’re not a BFA student. Oh, and the emoji he used stands for Qi Heng, because that emoji is called “Heng Heng”(an angry sound). I just find everything about him is so cute. So happy he will play more movies, I know he is always a true actor. I watched a video 2 years ago where he said he admires Tony Leung and wished to play some classic movies like him. He really likes to be something else not only an idol. I know, regardless of his co-stars, I will watch him, but that is just a wish. Did you watch the old drama where he played a naughty, spoiled young boy in a family? It is a lot of fun and he quite nailed that role. Sorry for my bad English, what does method actor mean? I heard some people said in guardian he brought his own personality on screen lol, just because in backstage he looks and acts like his character all the time. But when seeing him in interviews, he looks totally different, so I think you are right about his influence by his character. He is so deeply into the character that it takes quite a long to get out of it. In some interview he said he wants to continue in the character all the time when filming. So its more adorable when he played several characters in one drama, he must have worked so hard for that. Method actor is who tries to understand and feel the emotions of the character he or she represents. It's like he or she truly lives with the characteristics, thoughts and actions of the character during filming. In your mother tongue, you can call it "dien xuat nhap tam/nhap vai". But Siobhanne said he was not a method actor, what does she mean? Based on your explanation, he should be a method actor. Thank you. How do we know ZYL is not a method actor? This is a new interview with English subs (among others). It's a really nice serious interview about acting. Near the end of it he says that he wishes he could once experience fully transforming into a character. So I think method acting is something he's curious about, but not something that he currently practices. Also, he has said on many occasions that it's easy for him to come out of character. Anyway, I don't think there's a need to put one acting method on a pedestal above others. What matters to the audience are results, the methods are something for the actors to work and experiment with. OMG he is so talkative about acting lol, we can see his passionate here obviously. I understand what method acting means now, thanks so much. It is also clear why I feel this way about his characters, he acts naturally on his purpose, in his logical way that's why I can feel his characters so well. He is so straight about it. I agree about not putting one method above another, as long as it can touch audience. For example there was one comment about his Fu Hong Xue that why he was cold (not smile) most of the time, why not emotional. I explained because this character is like that, he had an extremely traumatic childhood, the only lesson his mother gave to him was revenge. Besides, his mother seemed to be the only relative left with him, so he is kind of suffered much, accepting the only road he can go. That's why he is not smiling, but from his eyes you can see all emotions (anger, hatre, pain, empty,...). His eyes are so impressive.